1. Pendleton Reporter, Salford, Broughton and Weaste Times. 2. Pendleton, Salford, Broughton Reporter. 3. Reporter for the County Borough of Salford. 4. Salford City Reporter and Salford Chronicle. 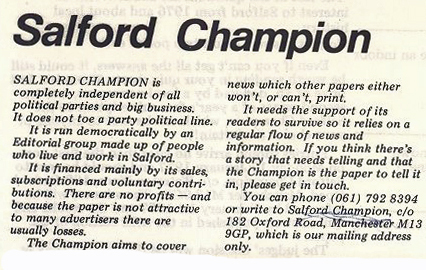 In 1894, it merged with The County Telephone, and Salford District Review, which was founded in 1889. Salford and West Manchester Journal. Sedgley Park and Broughton Gazette. Salford Echo & Broughton Gazette. The Manchester and Salford gazette and commercial advertiser. The Salford Champion appears to have vanished without trace, and cannot be found in library catalogues. It was operating in the late 1970s, as an 'Independent News Magazine". John Burgess appears to have been in charge of circulation.